Description Stace Collection - Samoa, people in local dress. 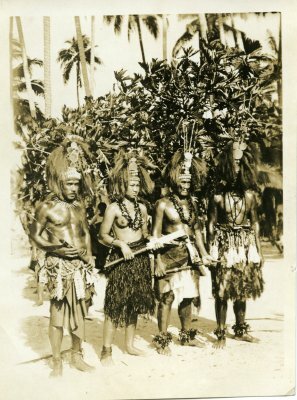 noted on back of photograph: "The headdress - "tuiga" in Samoan - may be worn only by certain specially chosen men and girls. If any unauthorised person presumes to put it on there is serious trouble"